This film by Stacy Peralta focuses on Steve Caballero, Tommy Guerrero, Tony Hawk, Mike McGill, Lance Mountain and Rodney Mullen. "The Bones Brigade was a talented gang of teenage outcasts. Unmotivated by fame or popularity, they completely dedicated their lives to a disrespected art form. For most of the 1980s, this misfit crew headed by a 1970s ex-skateboard champion blasted the industry with a mixture of art and raw talent becoming the most popular skateboarding team in history. 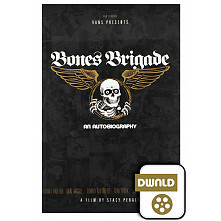 The core unit of the Bones Brigade built an empire that covered the world. They dominated contests, made hundreds of thousands of dollars, created the modern skateboard video, reinvented endemic advertising, pushed skate progression into a new era, and set the stage for a totally new form of skating called street style. There's nothing comparable in today's skateboarding"
Almost 3 hours of additional footage that wasn't included in the film.